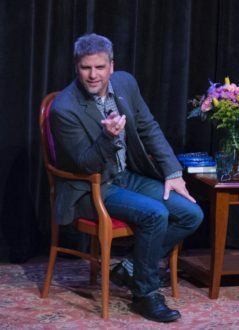 There was a moment during Garth Stein’s April 21 appearance at the National Writers Series when the bestselling author described climbing a Redwood tree and reaching the canopy. Stein paused just enough to let the packed audience at the City Opera House in Traverse City catch up to him in the treetops and sway along with him in the Pacific breeze. The adventurous author captivated the audience for the rest of the evening. While fielding questions from the evening’s guest host, Sarah Bearup-Neal (host of “Talk About Art,” an artist interview series at the Glen Arbor Art Associaton), Stein occasionally stood and faced the ticket holders, as if consulting the chorus. A Sudden Light interweaves the story of a rich, but dysfunctional, Seattle lumber-baron family and the Pacific Northwest timber industry during the 19th and early 20th centuries. The book features mystery, history, forbidden love and redemption, and characters so flawed that Bearup-Neal joked that she wanted them to have a southern accent. “These characters are right out of the Tennessee Williams’ guide to family dynamics,” she said. Dysfunctions aside, Stein’s characters, and their relationship with the outdoors, prompted the National Writers Series to name A Sudden Light its “Find Your Park…in a great book” selection for April. “Find Your Park” is a collaborative effort of the National Park Service, the National Park Foundation, and local community nonprofits, to celebrate the 100th anniversary of the National Park Service. The National Writers Series teamed up with Sleeping Bear Dunes to identify creative ways “…to discover a personal connection to a place or a story that provides inspiration or enjoyment, and to then join us in our second century of stewardship of America’s most treasured places,” National Park Service Director Jonathan B. Jarvis. John Muir, a naturalist and early advocate for preserving the wilderness that became America’s first National Parks, influenced characters in Stein’s A Sudden Light with his transcendental ideas and the spiritual understanding that we are all connected. Sometimes the boulder rolls in a direction the author didn’t expect. The Art of Racing in the Rain, for example, was banned by a school district in Dallas, Texas. When Bearup-Neal asked if the book banning caused Stein to grind his teeth, the author stood and shot the audience a mock cheer. “I’m banned in Texas!” he boasted. Stein then sat down and returned to a serious critique of administrators who pull the rug out from under their teachers. “We are putting students in schools that are led by paid professionals working on our behalf,” said Stein. “The fact is that we want our kids to be guided through social discussions by paid professionals who we trust with the education of our children.” Stein’s defense of public education drew applause all the way from the treetops.